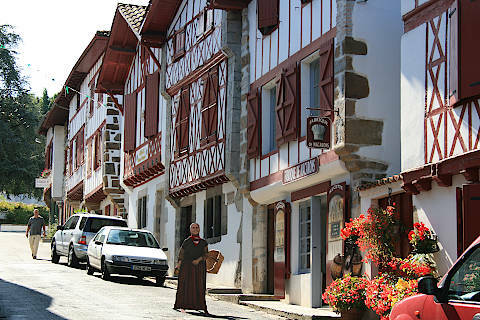 La Bastide-Clairence is a picturesque village in the Pyrénées-Atlantiques department, listed as one of the most beautiful villages of France. 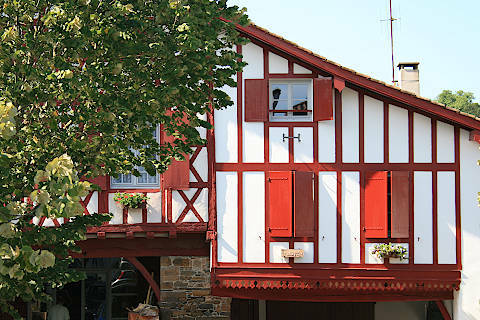 This bastide was founded in the XIV century by Louis I of Navarre, the future Louis X of France, at which time both Basques and Gascons came to live in the town. 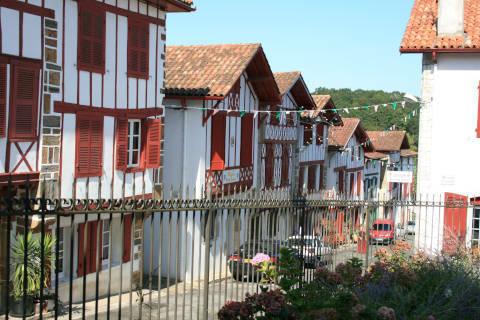 La Bastide Clairence is a bastide town with a definite Basque flavour. The houses are painted white and all have shutters painted in the deep red colour, or occasionally in green, both colours typical of the shutters in the region. We found the village to be charming and lovely to amble around. Most of the shops in the town are owned by local artisans, generally producing good quality rather than tourist quality goods. If you are looking for some unusual presents this is a good place to head for. The church is more ornate on the outside than most in the area. Inside it has the wooden galleries around the edge which are often found in Basque churches and give them a warm, welcoming feel. Next to the church is a Jewish cemetery. When you’ve had a good wander around the village you should go to the little shop at the top of the town on Rue Notre Dame which sells macaroons. These come in lots of flavours including chilli pepper using the famous Espelette piments. Delicious! 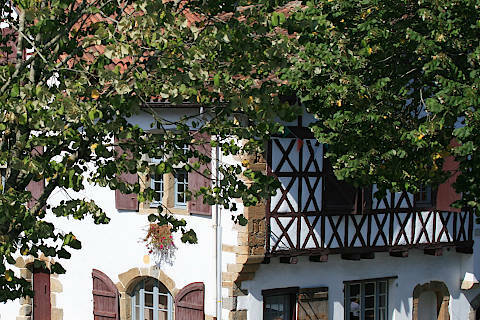 Take your bag to the little garden behind La Bastide-Clairece tourist office and enjoy. 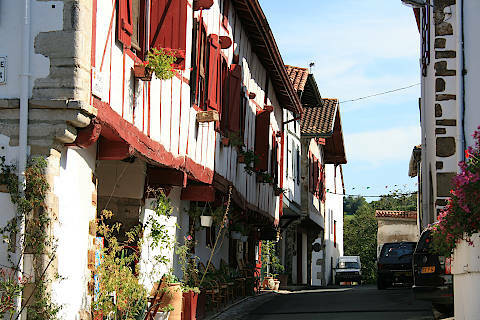 If you are visiting La Bastide-Clairence in September the village hosts a pottery fair which welcomes over 50 potters who come here from across Europe. 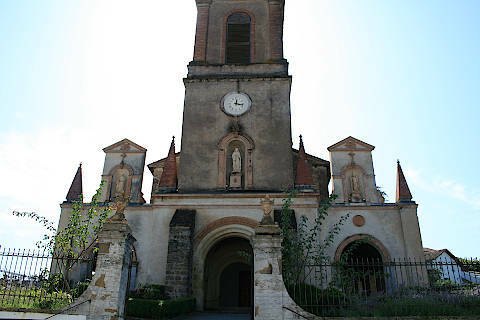 Close to La Bastide Clairence you can visit Abbaye de Belloc whose monks make a famous sheep’s milk cheese. South-east of the village at Saint Martin d'Arberoue you can vist the caves of Isturitz and Oxocelhaya, the former featuring prehistoric relics and the other with impressive rock formations such as stalactites. At Hastingues, just off the A64 north-east of La Bastide-Clairence, Arthous Abbey was active from the 12th to the 17th centuries, and is now restored and open to the public. It also houses a museum of heritage targetted at children and the'Landes region Departmental Centre of Heritage. 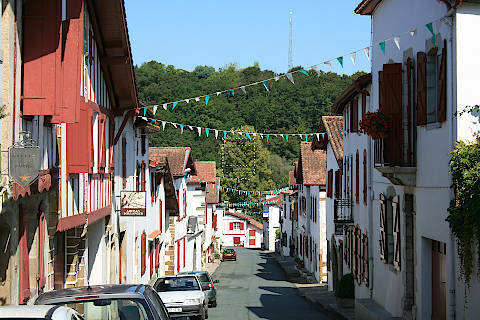 Two more 'most beautiful villages' can be visited nearby at Sare and Ainhoa.